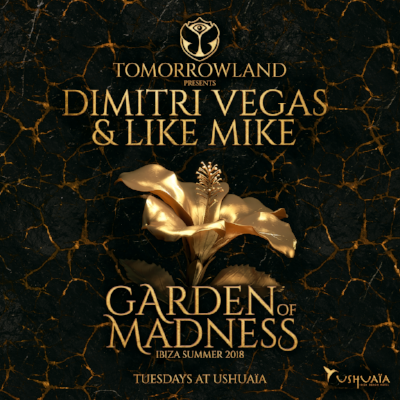 Ushuaïa Ibiza Beach Hotel is preparing for summer with the recent announcement of their first resident for 2018 – Tomorrowland presents Dimitri Vegas & Like Mike Garden of Madness. After an apparent successful debut last summer, The Garden of Madness is set to return for an extended run for its second season. Taking place every Tuesday from 19 June for 14 consecutive weeks, Tomorrowland residents Dimitri Vegas & Like Mike will be back at the helm. The Belgian brothers will be calling on a host of big name DJs to join them throughout the season, with last year’s guests including the likes of Steve Angello, Steve Aoki, Marshmello, David Guetta, Lost Frequencies, Carnage and Nervo. This year will feature a custom-built stage by the production team behind Tomorrowland, with an array of visuals aiming to make this one of the most impressive shows on the White Isle. Ushuaïa Ibiza Beach Hotel has made a name for itself over the past few years as one of the go-to destinations for island partygoers. Featuring a big name resident line-up, top production, lighting, visuals, pyrotechnics and dancers, with a different theme each night of the week, its poolside parties are hugely popular.